BOAC inaugurated the first transatlantic jet passenger service using a de Havilland Comet-4 flying between New York City and London. 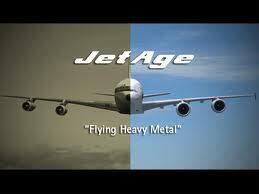 66 days after the FAA was established, the U.S. Jet Age began with a Pan Am B-707 flight to Paris. Probable cause: The pilot's unwise decision to take off in weather which would necessitate flying solely by instruments when he was not instrument rated. Contributing factors were serious deficiencies in the weather briefing, and the pilot's problem with the Bonanza's attitude indicator. "Sh-Boom (Life Could Be a Dream)"
1959 - American Airlines inaugurated transcontinental jet airliner service with Boeing-707 flights between New York and Los Angeles. In September 1959, the FAA commissioned the new San Antonio Air Traffic Control Center. 1959 - The Convair-880 (110 passengers), a four-engine medium-range jet airliner, built by General Dynamics Corporation first flew and entered into service in 1960 with Delta Air Lines. 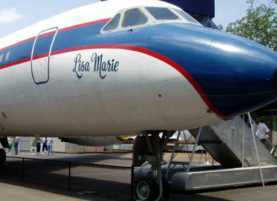 "The Pride of Elvis Presley Airways"
and called it the "Lisa Marie," after his daughter. He had the registration number changed to N880EP, and spent over $800,000 on customization, which included painting his personal logo: "TCB" ("Taking Care of Business in a Flash") on the tail. 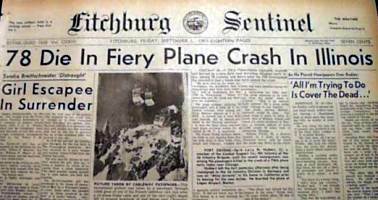 This was the first of many crashes of the Lockheed Electra. The NTSB determined the probable cause was premature descent below landing minimums, the result of preoccupation of the crew in the neglect of essential flight instrument references for attitude and height above the approach surface. Also limited crew experience in the Electra, erroneous setting of the captain's altimeter, marginal weather in the approach area, and possible misinterpretation of altimeter and rate of descent indicator. In the interest of Air Safety, the FAA raised the landing minimums for the Lockheed Electra until a conventional three-pointer type sensitive altimeter was installed. 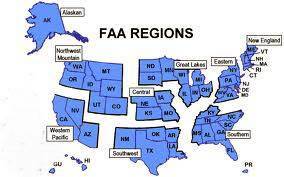 The FAA also established autopilot approach criteria and limitations for all air carriers. 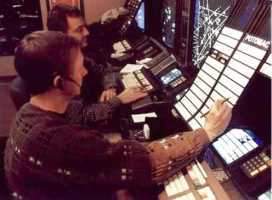 The FAA also recommended that all air carriers should establish flight simulator training programs, prior to putting into service, all aircraft which require significantly different operational techniques. 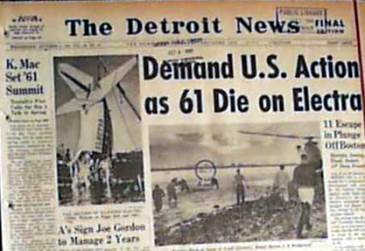 Additionally, all large turbine-engine aircraft needed to be equipped with a flight recorder. 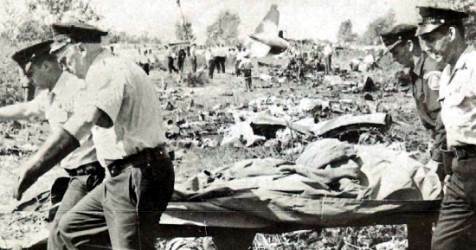 The Civil Aeronautics Board blamed the crash on the 'whirl-mode' prop theory that overstressed their wings and caused in-flight separation of the left wing from the aircraft. November 1959 - The Boeing-720 (140 passengers), a four-engine medium-range jet transport first flew, and entered scheduled service with United Airlines in 1960. 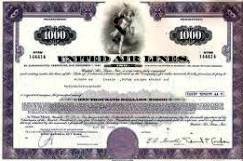 United Airlines was Boeing's first customer for the B-720. The original jet had Pratt & Whitney JT3C turbojet engines, while the B-720B had Pratt & Whitney JT3D turbofans, which had lower fuel consumption and higher thrust. 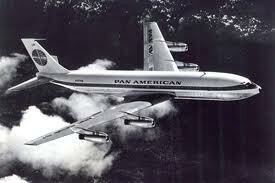 Only 154 were built, and it was replaced by the B-727. January 6, 1960 - A National Airlines DC-6B crashed near Bolivia, North Carolina killing 34 passengers and crew. 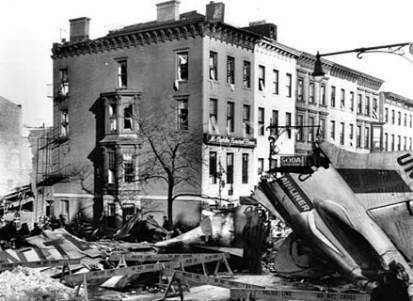 Investigation revealed a dynamite explosion, when a passenger had taken out more than a million dollars in life insurance. The FAA began the use of baggage-inspection devices. 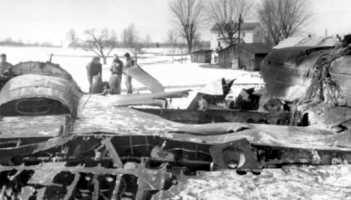 March 17, 1960 - Tell City, Indiana - A Northwest Airlines Lockheed Electra-188, from Chicago to Miami, FL lost a wing in turbulent air and crashed near Tell City, IN. 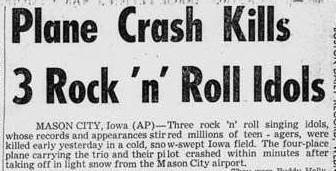 It was determined that the probable cause for this accident was in-flight separation of the right wing while cruising at 18,000 feet due to flutter caused by unexplained reduced stiffness of the engine mounts (later defined as "whirl mode"). Violent air turbulence could also have destroyed the aircraft. The FAA issued an emergency airworthiness regulation that reduced the top cruising speed of the Lockheed Electra to provide an adequate safety margin. The FAA also met with representatives of Lockheed, Allison, Electra Operators, NASA and the CAB. It was recommended that the Lockheed Aircraft Corporation conduct an engineering reevaluation of the Electra. This program included flight tests, structures investigations, aerodynamics investigations, design studies and special investigations and tests. 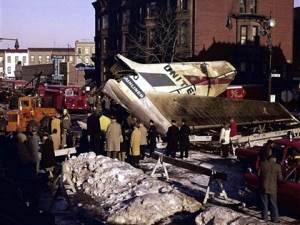 October 4, 1960 - An Eastern Airlines Lockheed Electra-188 crashed on take off into Boston Harbor killing all but 10 of the 72 aboard. (The 5th Electra crash in two years). The presence of many dead birds on the runway indicated that the accident had been caused by ingestion of birds into the aircraft's engines rather than structural failure. A number of starlings were ingested into engines Nos. 1, 2, and 4. Engine No. 1 was shut down and its propeller was feathered. Nos. 2 and 4 lost power and resulted in the L-188 yawing to the left and decelerating to stall speed. The left wing dropped, nose pitched up, and the L-188 rolled left into a spin and fell almost vertically into the water. To keep the flying public safe on future flights, the FAA initiated a comprehensive program of research into turbine engine bird ingestion, including improving the tolerance of all turbine engines to bird ingestion. Visibility at the time was less than 500 feet (no where near minimum takeoff requirements that most airlines observe), and the control tower lacked the authority to stop the pilot from taking off. 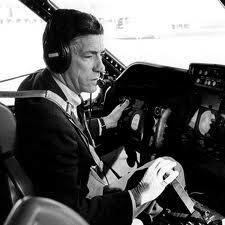 Later investigations revealed that the pilot was flying on a suspended license, but allowed to fly pending an appeal. 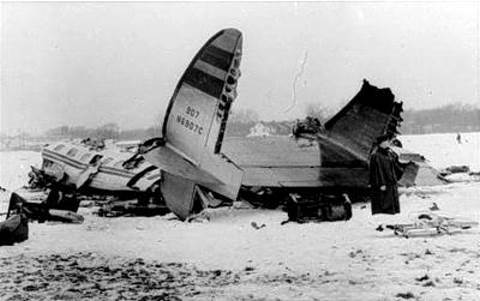 The overloaded WWII surplus twin-engine Curtiss C-46 began takeoff when the plane's left engine quit at about 100 feet and the plane dipped sharply to its left and nose-dived into the runway. Accident investigation concluded that the C-46 was overloaded by 2,000 lbs. above its maximum certificated gross takeoff weight. 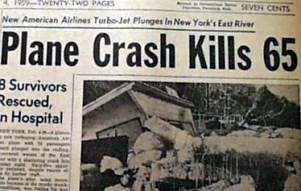 Following this crash, the Arctic Pacific Airlines lost its certificate for charter operations. 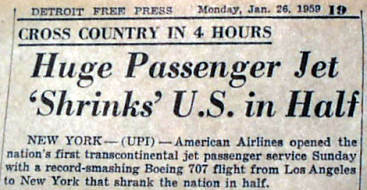 Note: NFL Hall of Fame coach (Cal Poly alumnus, 1957-58) John Madden's fear of flying is attributed to this crash. 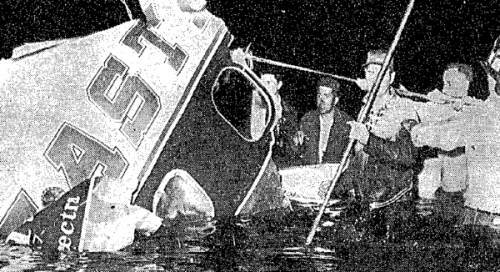 At the time of the crash he was coaching at Alan Hancock Junior College, and he knew many of the passengers aboard the C-46. The FAA implemented new rules concerning control tower authority and banned the use of chartered aircraft for college sports teams. The FAA also published a notice in the Airman's Guide that prohibited takeoff for commercial aircraft when the visibility is below 1/4 mile, or the runway visual range (RVR) is below 2,000 feet. 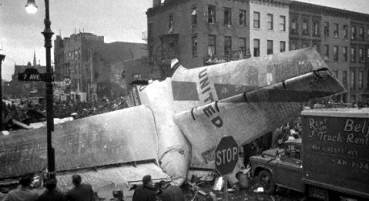 December 16, 1960 - New York City - A United DC-8 and a TWA Super Constellation collided. 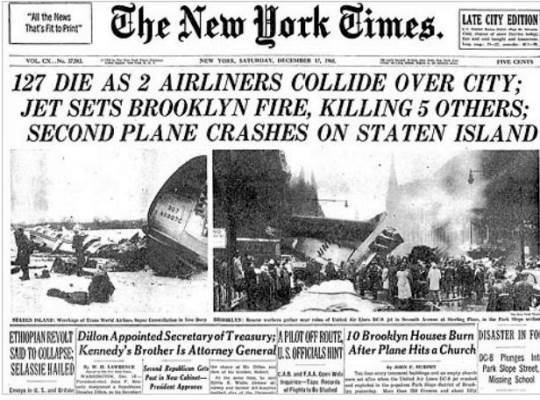 December 16, 1960 - A United DC-8 and a TWA Super Constellation collided in midair in a snowstorm over Staten Island, NYC, NY. 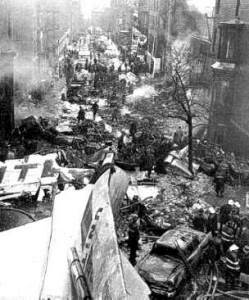 One crashed onto Staten Island and the other airliner crashed into Park Slope, a Brooklyn, NY neighborhood, killing all 128 passengers and 8 persons on the ground. An eleven-year-old boy, Stephen Baltz from Wilmette, IL was the only survivor. On impact with the ground, Baltz was thrown from the plane into a snowbank, where local residents rolled him in the snow to extinguish his burning clothing. 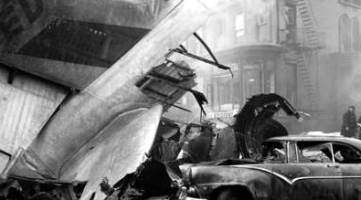 He later died of his injuries in Park Slope's New York Methodist Hospital. 1. A requirement that pilots flying IFR must report malfunctions of navigation or communications equipment. 2. 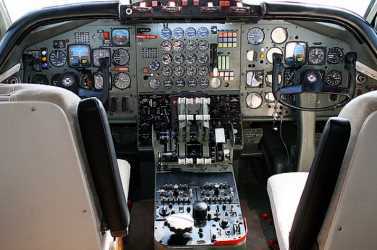 All turbine-powered aircraft must be equipped with distance-measuring equipment (DME). 3. Improved performance of radar handoff service for arriving and departing aircraft in the New York Metropolitan area. 4. Implemented a new airspeed rule prohibiting aircraft from exceeding 250K when within 30nm of a destination airport and below 10,000 feet. 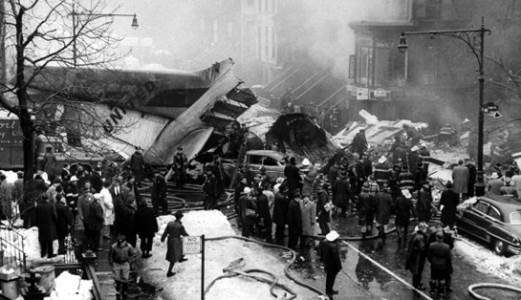 1960 - There were 65 aircraft accidents among domestic scheduled operations in 1960, resulting in over 350 deaths. 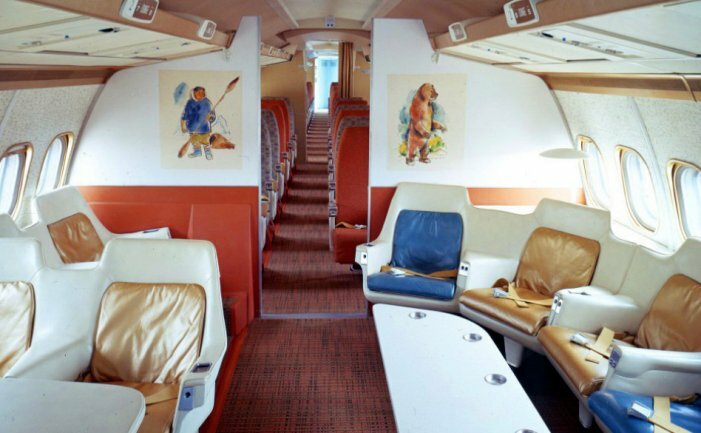 January, 1961 - The Convair-990 (121 passengers), a four-engine jet airliner of medium-to-long range built by General Dynamics Corporation first flew, and entered scheduled service in 1963 with Swissair. 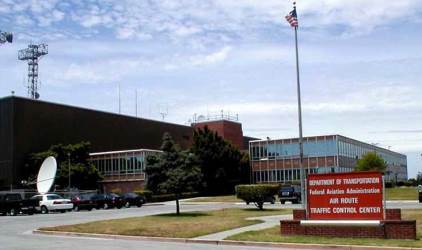 February, 1961 - The FAA commissioned the new Cleveland Air Traffic Control Center - (ZOB at Oberlin, OH) and also the new Jacksonville Air Traffic Control Center. (ZJX at Hilliard, FL). 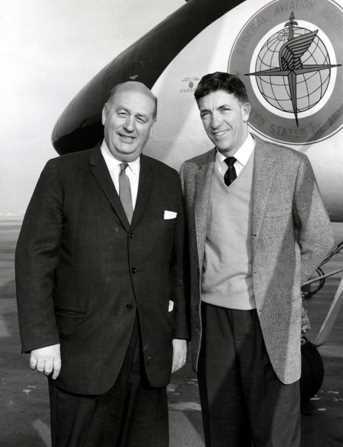 March 3, 1961 - President John F. Kennedy announced that Najeeb E. Halaby would become the 2nd FAA Administrator. Halaby earned his student pilot certificate at age 17 in 1933, served as a test pilot for Lockheed early in WWII, and participated in the first flights of U.S. jet-powered aircraft. He also had a B.A. from Stanford and a law degree from Yale, and director of his own law firm in Los Angeles. Administrator Halaby decided to decentralize the agency's operational responsibilities and developed a program to open nine Regional offices: Eastern Region, Southwest Region, Central Region, Western Region, Alaskan Region and Hawaiian Region - later Pacific Region. May 1, 1961 - Code: 7500 (4-digit universal transponder hijack code) - First Aircraft Hijacking - The first series of aircraft hijackings in the U.S. began when a passenger on a National Airlines Convair-440 to Key West, FL held a knife to a pilot's throat and points a gun a the co-pilot and demands the pilot to fly to Cuba. Four other 'skyjacking' incidents took place by the end of August. 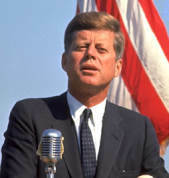 In September, President Kennedy signed into law that interference with aircrew members or flight attendants in the performance of their duties was punishable by death or imprisonment for not less than 20 years. The FAA took further action to reduce the number of hijackings by implementing a special corps of FAA safety inspectors, trained for duty aboard airline flights. 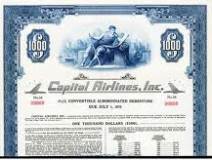 June, 1961 - The biggest U.S. domestic airline merger occurred when United Air Lines absorbed Capital Airlines. The plane struck with such force that the only remaining sizable parts were two fins from the triple tail, which were found 400 feet apart. Craters three to four feet deep were found where the four engines and nose hit with pulverizing force. 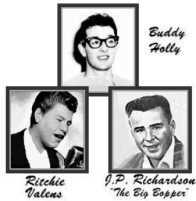 Flames, fed by more than 3,000 gallons of high-octane fuel, illuminated the carnage: bodies torn apart, and mother and infant clinging in death's embrace. 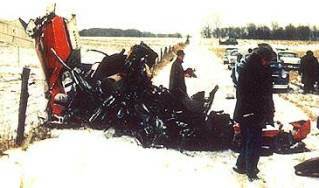 The crash wiped out four entire families, one of them with seven members. A mother with her four children were killed as the husband and father awaited their arrival in San Francisco. The official CAB Report said the plane, flying at 1,800 feet heading West until it turned North at 63rd Street and Clarendon Hills Rd., where the right fin of the triple-tail Constellation fell off. 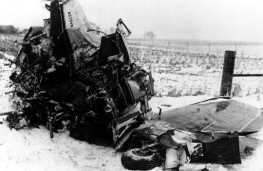 A second fin was found 400 feet north, where the rest of the plane hit and shredded as it hurtled through the fields until the engines and nose burrowed to a halt at 59th St. The FAA, always striving to make flying safer, required an amendment to the Constellation Flight Manual to include "procedures for turning off the elevator boost with an uncontrollable elevator". Additionally they recommended design changes to the shifting system. 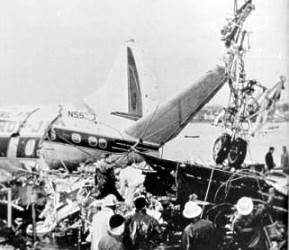 September 17, 1961 - Chicago - A Northwest Airlines Lockheed L-188 Electra crashes on takeoff from Chicago as a result of a maintenance error causing the ailerons to become detached from the control wheels. Just after liftoff from O'Hare, the Electra was observed to make a right turn with a slowly increasing rate of bank to 30-45 degrees. The cable physically connecting the first-officer's control wheel to the aileron boost unit had disconnected and caused the ailerons to put the L-188 in a starboard-wing-down attitude. 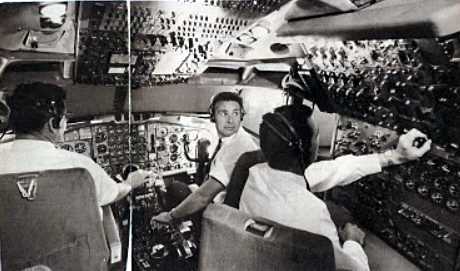 The pilots were unable to correct the bank. The cables had been removed two months before the accident during routine maintenance. A safety cable that held part of the assembly together had not been replaced when the cables were hooked back up. The contact slowly separated and completely failed during the takeoff sequence. The NTSB determined that the probable cause of this accident was a mechanical failure in the aileron primary control system due to an improper replacement of the aileron boost assembly, resulting in a loss of lateral control of the L-188 at an altitude too low to effect recovery.